The term hardware in the field of computers refers to the physical parts of a computer system like monitor, keyboard, printer etc. 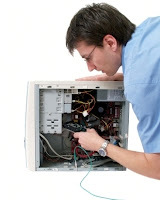 As the number of computer system is rising in the world there is a huge demand for professionals who can repair and troubleshoot hardware problems. Therefore a career in hardware is a very rewarding one provided that you have sounds skills in this domain. The professionals associated with the discipline of research of computer hardware are known as hardware engineers. They also design and supervise the process of manufacturing and installation of hardware. Presence of Indian and foreign IT majors in the country has created a lot of scope for youths in this sector. Although there is no popular formal degree course available for hardware professionals, there are many courses and qualifications available from informal sector. It will be better to complete at least a graduation degree (science/electronics preferred) along with a course in hardware. A diploma in hardware will definitely give you practical knowledge in the field which is very much required. There are many colleges and institutes that offer courses on hardware technology. You can search for an institute by making a small search on the internet. You should keep in mind that learning hardware is different from learning ‘assembling’ of computers. Many so called hardware training institutes teach computer assembling and very basic hardware skills like refilling an ink cartridge that isn’t exactly a job of hardware professionals. Before joining an institute, have a good look at their course contents, check whether it contains knowedege of mother boards,circuit boards, RAM, hard disks, printers etc. You should not learn how to replace the faulty component but also how to repair it. Remember that this is more of a practical subject so join a course that gives you more and more practice time on actual hardware rather than focusing on the theoretical part. This is no news that the use of computer is rising in the whole world and will continue to rise. The speed at which computers and related peripherals are being bought by the users also suggest that at some time these products will require some kind of repair or servicing also. This makes choosing the field of hardware a very decent option. Hardware developing companies are the favoured place for most of the Hardware engineers. They can seek to be employed in corporate houses, industries, public sector undertakings. All public and private sector banks, financial institutions, school and collages also require the service of Hardware and Networking experts. Besides they can be self-employed by starting their own Hardware assembling firm. He can also run consultancy to develop hardware according to the requirements of the clients. Teaching in technical educational institutions is also a very good option. Centre for Development of Advanced Computing is one of the leading institutes of the country followed by some private players including, Aptech Hardware and Networking Academy, JetKing, IIHT etc. To start with a hardware professional can easily earn anything between 8000 to 10000 per month. As the experience and qualification of a person increases he/she can expect an income of 20000 to 30000 per month. Having said that do remember that a person having an expertise in this field can certainly cross these limits and earn more than 50000 per month. I tend not to drop a ton of remarks, however i did a few searching and wound up here "Careers in Hardware".